10 • March 2019 • S I G N & D I G I T A L G R A P H I C S Get the latest industry news from Tony Kindelspire five days a week by signing up for our eNewsletter at sdgmag. com. Look for the red "Get the eNewsletter" button on the home page. Have industry news to submit? 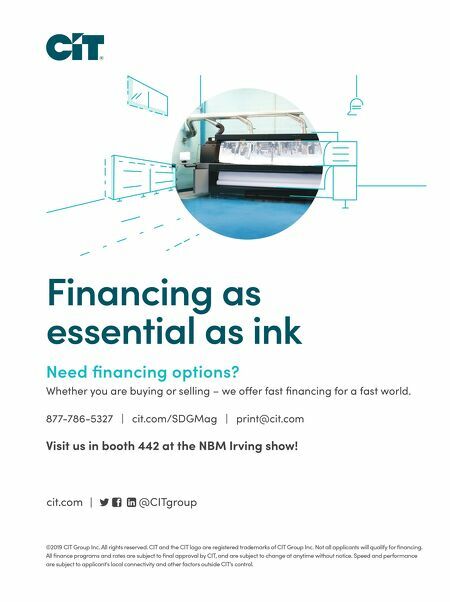 Contact Tony at tkindelspire@ nbm.com. 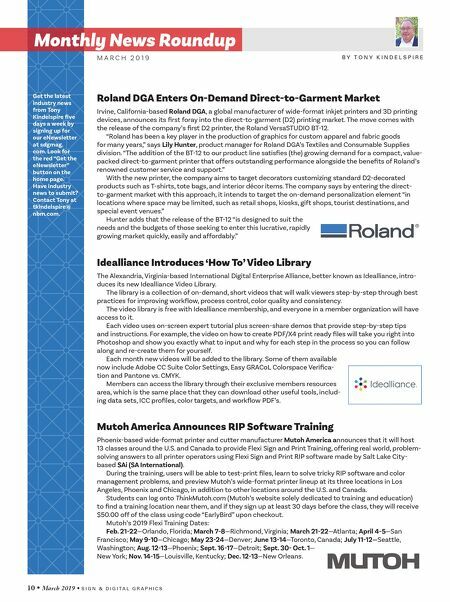 Monthly News Roundup B Y T O N Y K I N D E L S P I R E M A R C H 2 0 1 9 Roland DGA Enters On-Demand Direct-to-Garment Market Irvine, California-based Roland DGA, a global manufacturer of wide-format inkjet printers and 3D printing devices, announces its first foray into the direct-to-garment (D2) printing market. The move comes with the release of the company's first D2 printer, the Roland VersaSTUDIO BT-12. "Roland has been a key player in the production of graphics for custom apparel and fabric goods for many years," says Lily Hunter, product manager for Roland DGA's Textiles and Consumable Supplies division. "The addition of the BT-12 to our product line satisfies (the) growing demand for a compact, value- packed direct-to-garment printer that offers outstanding performance alongside the benefits of Roland's renowned customer service and support." With the new printer, the company aims to target decorators customizing standard D2-decorated products such as T-shirts, tote bags, and interior décor items. The company says by entering the direct- to-garment market with this approach, it intends to target the on-demand personalization element "in locations where space may be limited, such as retail shops, kiosks, gift shops, tourist destinations, and special event venues." Hunter adds that the release of the BT-12 "is designed to suit the needs and the budgets of those seeking to enter this lucrative, rapidly growing market quickly, easily and affordably." Idealliance Introduces 'How To' Video Library The Alexandria, Virginia-based International Digital Enterprise Alliance, better known as Idealliance, intro- duces its new Idealliance Video Library. The library is a collection of on-demand, short videos that will walk viewers step-by-step through best practices for improving workflow, process control, color quality and consistency. The video library is free with Idealliance membership, and everyone in a member organization will have access to it. Each video uses on-screen expert tutorial plus screen-share demos that provide step-by-step tips and instructions. For example, the video on how to create PDF/X4 print ready files will take you right into Photoshop and show you exactly what to input and why for each step in the process so you can follow along and re-create them for yourself. Each month new videos will be added to the library. Some of them available now include Adobe CC Suite Color Settings, Easy GRACoL Colorspace Verifica- tion and Pantone vs. CMYK. Members can access the library through their exclusive members resources area, which is the same place that they can download other useful tools, includ- ing data sets, ICC profiles, color targets, and workflow PDF's. Mutoh America Announces RIP Software Training Phoenix-based wide-format printer and cutter manufacturer Mutoh America announces that it will host 13 classes around the U.S. and Canada to provide Flexi Sign and Print Training, offering real world, problem- solving answers to all printer operators using Flexi Sign and Print RIP software made by Salt Lake City- based SAi (SA International). During the training, users will be able to test-print files, learn to solve tricky RIP software and color management problems, and preview Mutoh's wide-format printer lineup at its three locations in Los Angeles, Phoenix and Chicago, in addition to other locations around the U.S. and Canada. Students can log onto ThinkMutoh.com (Mutoh's website solely dedicated to training and education) to find a training location near them, and if they sign up at least 30 days before the class, they will receive $50.00 off of the class using code "EarlyBird" upon checkout. Mutoh's 2019 Flexi Training Dates: Feb. 21-22—Orlando, Florida; March 7-8—Richmond, Virginia; March 21-22—Atlanta; April 4-5—San Francisco; May 9-10—Chicago; May 23-24—Denver; June 13-14—Toronto, Canada; July 11-12—Seattle, Washington; Aug. 12-13—Phoenix; Sept. 16-17—Detroit; Sept. 30- Oct. 1— New York; Nov. 14-15—Louisville, Kentucky; Dec. 12-13—New Orleans.